I can't believe you watched all of that. The best part was the post-game show... Joe Maddon talking to reporters. And then he looked at the camera and said "Is anybody watching this?" And then the hosts asked for tweets of people still awake, and after the commercial break they said they had received 70 and still counting. The release of finally winning that game was a rush. I couldn't sleep for another hour. Yes. Rays win again. 3 in a row over Baltimore. I think that 18-inning win might have got things rolling in Tampa. One more big game tomorrow afternoon at 3pm, then they have to finish on the road. And the O's are toast. Dammit. 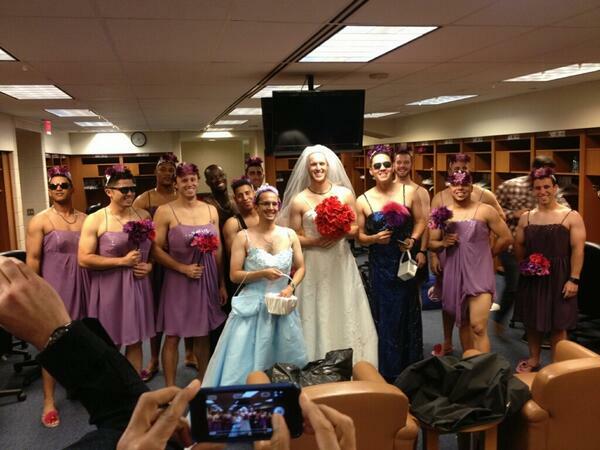 I don't know what's most distressing about this, the dresses or how many frickin' rookies the Mets are playing these days. 7 days left, counting today. I'd been rooting for the Orioles to stay in the hunt, as I'll be in Baltimore on business this week and was hoping to go see some high-stakes-playoff-stretch-run baseball. Alas, the O's look out of it, so instead I will be enjoying some ultimately meaningless September baseball in what will undoubtedly be a half-empty stadium. A really nice stadium, mind you. And the beer will be cold, so there's that. Yeah if the Rays beat the Orioles today (starts in 40 min. ), they are done. They'd be 6 back with 6 to play, so not mathematically eliminated, but with 5 other teams in the fight, pretty much over. Don't follow the NL as much, but I guess the playoff teams are almost set? Mostly positioning to be decided. Looks like Braves and Dodgers won their divisions. And then it's St Louis, Cincinnati, and Pittsburgh with 2 games separating them all. So someone wins that division, and the other 2 are the wild cards most likely. Washington is 5 back, so a slight chance. But they are @StL the next 3 days. Pitt & Cin finish with a 3 game series @Cin this weekend. If the Cardinals hold off the Nationals then the Pirates and Reds will play a 3 game series to determine home field for the wild card and then head right into an elimination game with each other. That Pirates-Reds series is going to be fun to watch. Hopefully, the division title will stay in the mix until the weekend. Would make for a great finish. Meanwhile, as much as I'd like to see KC make the playoffs, it doesn't look likely. Your Rays are in the driver's seat, Stele, but it won't be easy. Three at Yankee Stadium, while the Rangers get to host the Astros. Again, it looks like this one could come down to the final weekend as well. Fingers crossed. Yeah we also have to avoid tying with Texas. They won the season series 4-3 so we'd have to play there. Eliminate the Orioles at home. Eliminate the Yankees on the road. Win enough games at Toronto to get home field for the wild card. Doubt that we'll have anything quite as exciting as 2011. But it's still cool to see so many teams alive for just 2 spots with 1 week to play. Ugly injury to Machado in the Orioles-Rays game. His knee went the wrong direction when he hit first base. Tough to watch. I wonder if he'll be ready to start next season? That looked like it could have been an ugly ligament tear. Then 2nd base (Casilla?) collided with an outfielder in the 7th and dropped the ball. Looked like his head hit the guy's thigh/knee. Thought he was concussed but they left him in. Rays tied the game on that one. Yes! Rays win. Loney with a solo HR in the 9th. Congrats. Late season, 9th inning, game-tying/winning home runs down the right filed line at the Trop are becoming a thing. 21 long years, but they are back to playing meaningful games in October. I think I am going to root for them to go all the way with the Phillies locking up their October tee times. 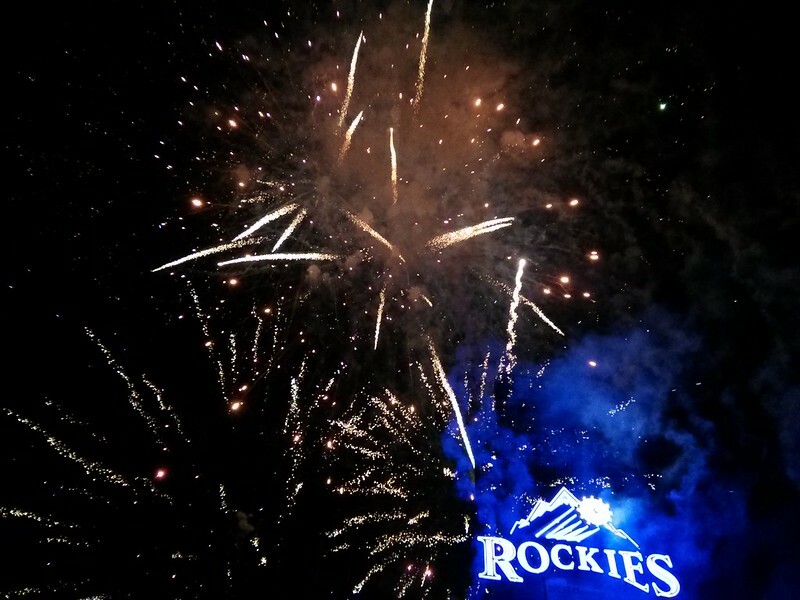 I went to a Rockies game this past Friday and hey, they won! 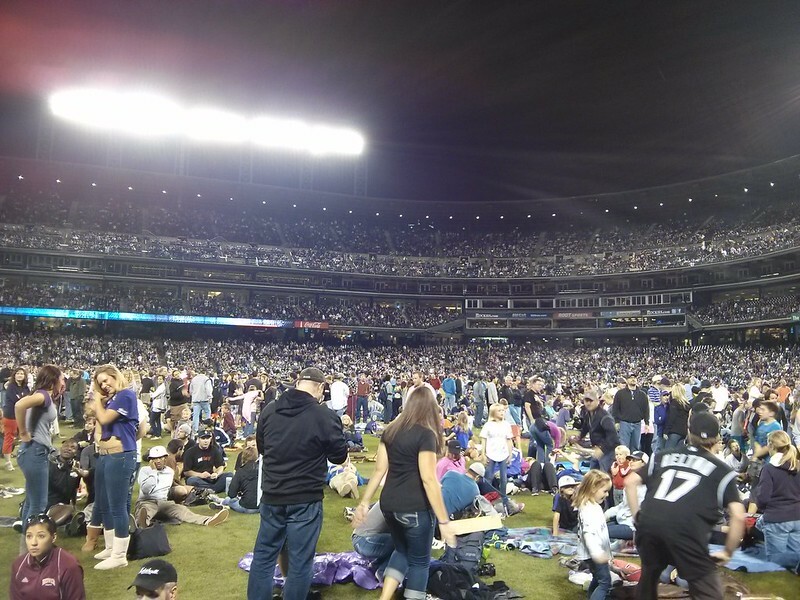 After the game our section was moved onto the field. So we could see the fireworks show! 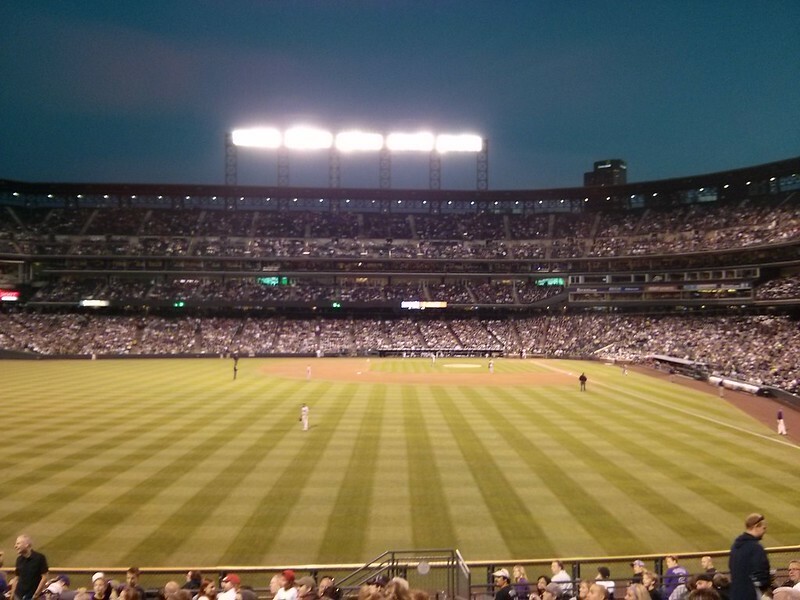 It was my first baseball game in many years, had a great time! Was over in the first, as the Rays went up 3-0 and NY never threatened. Damn. Wacha was one out away from a rookie no-hitter, and a chopper over the mound does him in. The Cardinals have had a pretty amazing run of rookie pitchers this season. That was the 35th win of the season by a rookie pitcher. You're welcome to everyone else. The Rays have eliminated the Yankees from post-season. It's not as if the Yankees were a threat. There's a Red Sox fan here at work who has been bragging lately and I'm like, "Dude, THIS Yankee team is the team you want to brag about beating? Where were you when the Yankees were actually good?" Lyle Overbay? Vernon Wells? Ihchiro? Hafner? That was a good team in 2005, not 2013. I'm surprised you didn't come back with the usual Yankee fan lame reply when they are losing "Yeah, but how many championships do you have". Yes! Rays win 4-0. Sweep the Yankees in 3 games, outscoring them 19-3, with 2 shutouts. 3 more @Toronto to finish it up. Looks like Cleveland is winning right now but Texas is losing. Nah, you're just really happy about the Yankees missing the playoffs. We all are.